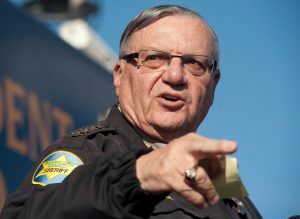 “I am pleased to inform you that I have just granted a full Pardon to 85 year old American patriot Sheriff Joe Arpaio. He kept Arizona safe!,” Trump tweeted late Friday after the White House announced that he had used his pardon power for the first time, sparing a political ally the prospect of jail time for defying court orders to halt police patrols that focused on Latinos. The announcement came as Trump hunkered down at the Camp David presidential retreat while millions along the Texas coast braced themselves for Hurricane Harvey’s impact. Trump’s decision also followed the uproar that ensued after he said “both sides” were responsible for deadly violence during race-fueled clashes this month in Charlottesville, Virginia. There is no legal dispute over Trump’s ability to pardon in a contempt of court case, as was Arpaio’s. The U.S. Supreme Court ruled in 1925 that a presidential pardon for a criminal contempt of court sentence was within the powers of the executive, and Trump had telegraphed his move for days. But the pardon was unusual given that Arpaio was awaiting sentencing. It also had not gone through the normal pardon process, which includes lengthy reviews by the Justice Department and the White House counsel’s office. The Washington Post reported Saturday that Trump had asked Attorney General Jeff Sessions last spring whether it would be possible for the government to drop the criminal case against Arpaio. After being advised that would be inappropriate, Trump decided to let the case go to trial and, if Arpaio were convicted, could grant clemency later, the Post reported. The newspaper said its sources, who were not identified, were three people with knowledge of the conversation. Reaction to Trump’s pardon was sharp and swift, including among some fellow Republicans with whom the president has been feuding openly. The state’s junior senator, Republican Jeff Flake, also disagreed with the move. “I would have preferred that the president honor the judicial process and let it take its course,” tweeted Flake, a Trump critic who has come in for particularly harsh treatment from the president. Trump has called Flake, who is up for re-election next year, “toxic” and “WEAK” on border issues and crime. Trump has rooted openly for Flake’s GOP challenger, state Sen. Kelli Ward, who supports Arpaio’s pardon, which could become an issue in the race. “We applaud the president for exercising his pardon authority to counter the assault on Sheriff Arpaio’s heroic efforts to enforce the nation’s immigration laws,” she said. But while the pardon could in the short term energize Trump’s conservative base, which includes many with strong anti-immigration views, the decision could further alienate voter groups, such as Latinos, whose support the Republican Party has said it needs to win future elections. Trump managed to defy those dynamics in 2016. Jens David Ohlin, vice dean and professor at Cornell Law School, said he was disturbed by the pardon, given Trump’s relationship with the judiciary. “Ever since the campaign and the beginning of his administration he’s had a very contentious relationship with the judiciary and hasn’t shown much respect for either members of the judiciary or the proper role of the judiciary within our constitutional structure,” Ohlin said Saturday. During the campaign, Trump called Chief Justice John Roberts “an absolute disaster” and “disgraceful,” mainly for two opinions Roberts wrote that left President Barack Obama’s health care law intact. Trump also went after U.S. District Judge Gonzalo Curiel, who presided over fraud lawsuits against Trump University. Trump said Curiel was “a hater of Donald Trump” who couldn’t be fair to Trump because of Curiel’s “Mexican heritage” and because of Trump’s campaign pledge to build a wall on the U.S.-Mexico border. Trump also referred to U.S. District Judge James Robart as a “so-called judge” after Robart imposed a temporary halt on Trump’s travel ban. Arpaio earned a national profile by acting aggressively to arrest immigrants in the U.S. illegally, including tactics that Latino and immigrants’ rights advocates said were akin to racial profiling. His alliance with Trump centers heavily on immigration enforcement, such as getting local police officers to participate in immigration enforcement. Both men have also questioned the authenticity of Obama’s birth certificate. They share a similar history of sparring with judges and even a birthday, June 14. P.S. Ruckman Jr., who edits a blog about presidential pardons, said the pardon is not an indicator of any serious interest by Trump in the pardon power. “It just looks like a political stunt, basically, as opposed to an act of policy,” Ruckman said. It is not unprecedented for a president to issue a pardon in his first year in office. President Gerald Ford pardoned Richard Nixon for his involvement in the Watergate scandal just four weeks after assuming office when Nixon stepped down. George H.W. Bush granted clemency after seven months in office. Ruckman said that waiting until the end of a term to issue a pardon often gives the appearance that the president is trying to skirt accountability for it. President Bill Clinton ignited a major controversy on his final day in office with a last-minute pardon for fugitive financier Marc Rich, the ex-husband of a major Democratic fundraiser. A year and a half before was to leave office, President George W. Bush set off a political backlash for commuting the prison sentence of I. Lewis “Scooter” Libby in a perjury and obstruction of justice case stemming from a CIA leak.